Many dogs love to spend time outdoors enjoying the fresh air. But it’s important to take measures to protect them from the elements. If your dog likes to relax and sleep in your yard, it’s a good idea to invest in an outdoor dog house to keep them safe and comfortable. But with so many options to choose from, it can be difficult to know which outdoor dog house is best for your four-legged friend. We reviewed dozens of outdoor dog houses to identify the best of the best, based on factors including quality of materials and construction, affordability, and Amazon reviews. We then narrowed our search down to 5 of the best outdoor dog houses available today. A comfortable outdoor doghouse with a rooftop balcony for sunbathing. We’ve identified the Merry Pet MPS002 Wood Room with a View Pet House as our top pick of the outdoor dog houses we reviewed. It stood out to us during the course of our research thanks to its sturdy wooden construction and comfortable, unique design. The Merry Pet MPS002 Wood Room with a View Pet House is a charming outdoor dog house with a comfortable lower lounge area and rooftop balcony for sunbathing. It is constructed from high-quality kiln-dried wood treated with natural color stains to enhance its appearance and durability. The outdoor dog house is easy to assemble and features a removable roof top and bottom panels for easy cleaning. Most reviewers are impressed with the quality and design of this unique and stylish product. An attractive, safe, and easy-to-assemble outdoor dog house. The Suncast DH350 Dog House is designed with simplicity and longevity in mind. It is constructed from durable resin and can be snapped together for easy assembly. The outdoor dog house also features a removable roof for easy cleaning and vents to improve air circulation. Many reviewers are happy with the dog house and praise its affordability, easy assembly, and durability. This product is suitable for dogs up to 100 pounds. A sturdy outdoor dog house designed for dogs up to 70 pounds. The Suncast DH250 Dog House is the younger brother of our runner up pick, the Suncast DH350. This affordable outdoor dog house features the same solid construction and easy assembly, but is designed to house dogs up to 70 pounds. The dog house also features a removable roof for easy cleaning and vents for improved air circulation. Overall, it is a well-designed product that provides excellent protection from the elements for small to medium size dogs. 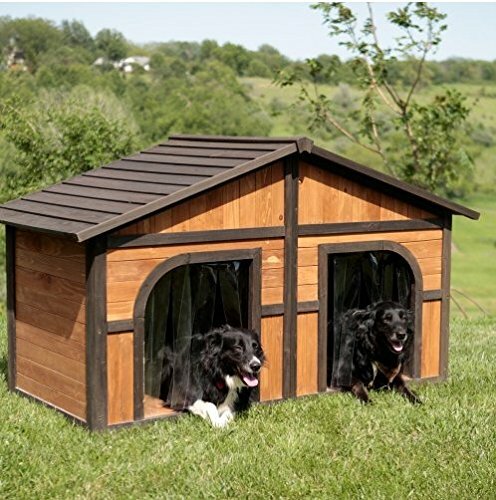 A spacious twin dog house that’s perfect for larger breeds. If you’re the pet parent of a large breed dog, the Merry Products Extra Large Solid Wood Dog House can provide your pup with the comfort they need. The spacious twin dog house comes with a removable partition, making it suitable for accommodating 2 large dogs or 1 extra-large dog. The sturdy dog is house is constructed from solid wood and features removable roof and floor panels to make cleaning a breeze. Reviewers say this house is spacious and retains warmth in cold weather. A comfortable, durable, and attractive small outdoor dog house. The Always-Quality Small Dog House features a simple design with plenty of space for small and toy breeds of dog. The attractive small outdoor dog house is made from tough, smooth plastic that’s easy to wipe clean. It also features vents for air circulation and a raised floor for improved insulation. The dog house is available in 3 colors and can be easily assembled in minutes. Reviewers say this house is also suitable for cats and other small animals. Outdoor dog houses are designed to protect your pet from the elements. They are ideal for dogs that live outdoors or spend a lot of time in the yard. There are many sizes and styles of dog house to choose from, and they are available in a range of different materials. When shopping for a dog house, make sure to consider factors such as your pet’s size and the climate in your area. You’ll also want to choose an outdoor dog house that’s durable enough to hold up over time. If your dog spends a lot of time in an outdoor dog house, it’s also important to make sure they can’t escape from your yard. For more information on keeping your dog secure, check out our list of the best wireless dog fences. Quality and durability of materials. Look for an outdoor dog house made from strong, sturdy materials that will stand the test of time. Wooden and plastic dog houses are the most popular choices on the market. Advantages of wooden houses include a traditional appearance and natural insulation. Plastic houses are often more cost-effective and naturally resistant to extreme weather. Size. Outdoor dog houses come in a wide variety of sizes to fit almost every breed of dog. Before making a purchase, measure your pet and check the dimensions of the dog house you are considering. The house should be large enough to give your dog room to lie down, stand up, and turn around comfortably. Style. Outdoor dog houses are available in a huge range of styles, from simple plastic kennels to elaborate wooden houses. Consider your pet’s needs before making a decision and choose a house that will keep them comfortable and secure. Ventilation. It is very important to choose an outdoor dog house that is properly ventilated and allows air to circulate. This will minimize the risk of your pet becoming overheated when the weather is warm. Good ventilation will also help prevent a buildup of moisture in the house during the winter months. Insulation. If you live in a colder environment, a well-insulated outdoor dog house can protect your dog from wintry weather. Look for houses with built-in insulation and sealed doors to prevent drafts. Some insulated outdoor dog houses also feature a domed shape to retain warmth. Roof and floor. Make sure the outdoor dog house you choose has a sturdy roof and floor to protect your dog from the elements. One useful feature is a raised floor to improve air circulation and protect your pet from pests and parasites. Some houses also have removable roof and floor panels to allow for easy cleaning. How big should a dog house be? An outdoor dog house should be big enough to allow your dog to lie down, stand up, and turn around comfortably. Please measure your dog before making a purchase to ensure the dog house is large enough to accommodate them comfortably. How can I keep my dog’s house warm in the winter? A well-insulated dog house will retain heat and keep your dog warm in the winter. If you live in a particularly cold climate, consider a heating unit or heated dog bed to provide extra warmth. Is straw a good bedding for dogs? No. Although straw is a suitable bedding for livestock, it is not ideal for dogs. Straw can rot when wet and can also become a breeding ground for parasites and bacteria. Instead, choose washable bedding such as blankets or a durable dog bed. What is a safe temperature for a dog to be outside? As a general rule, is it unsafe for dogs to be outside in temperatures lower than 32 degrees Fahrenheit or higher than 85 degrees Fahrenheit. However, these figures can vary based on age, breed, and general health. Please ask your veterinarian for more information about safe outdoor temperatures for your dog. We looked at 20 other outdoor dog houses. Even though they didn’t make our 5 best outdoor dog houses, they’re the best of the rest and each is still is great option for your pup. The information you’ll need to compare each one is included with the listing. This charming outdoor dog house is constructed from durable resin and designed for medium to large size dogs. A strong and stable outdoor wooden dog house for medium to large size dogs that features a waterproof roof and raised floor. This weather-resistant wooden dog house from Tangkula features a classic log cabin design with an attractive pink and white finish. A wooden outdoor dog house for small dogs with a weather-resistant asphalt roof and waterproof paint. 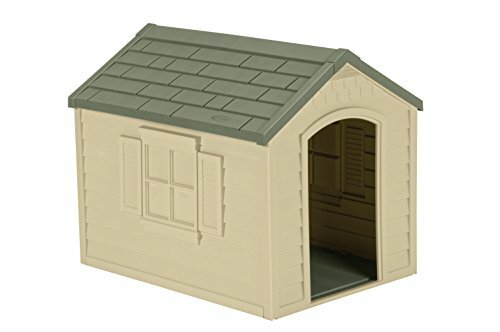 A comfortable small outdoor dog house with a slanted roof and off-centered doorway to protect against harsh weather. 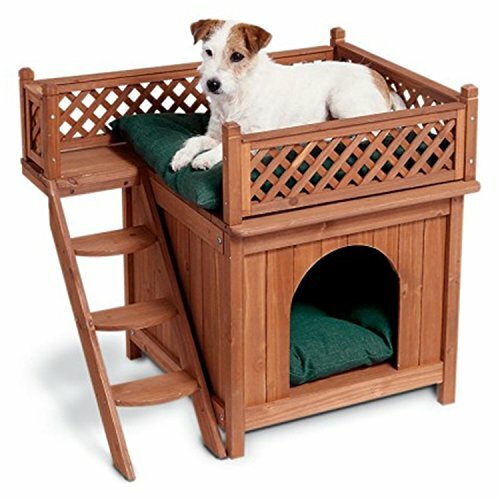 A natural and beautiful wooden dog house for small dogs with latticed railings and slatted windows. A solid wood small outdoor dog house with a waterproof roof and raised floor. Reviewers say this dog house is beautiful and well built. If you live in a colder climate, this insulated outdoor dog house with an integrated floor heater is perfect for keeping your pup warm. This insulated outdoor dog house from Petmate features an igloo design to provide insulation in hot and cold weather. A durable, long-lasting outdoor dog house with all-weather protection and a rear ventilation system. A tough, weather-resistant outdoor dog house with a spacious interior. Reviewers say this dog house is roomy and easy to assemble. A waterproof and well-ventilated plastic outdoor dog house with an elevated floor and detachable roof. A heavy-duty, solid cedar outdoor dog house with a waterproof asphalt roof and adjustable feet. This cool and comfortable outdoor dog house is well ventilated and provides excellent weather protection. A tough, barn-shaped outdoor dog house that’s designed to protect your pet from hot or cold weather. This weatherproof, kiln-dried cedar dog house will keep your pet safe and dry in extreme conditions. 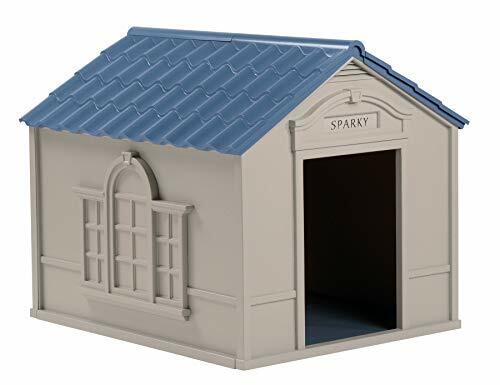 The Arf Frame Dog House from Pet Squeak is a close-fitting wooden habitat for dogs that prefer a tighter den. A solid wood dog house with stainless steel hardware that’s designed to provide protection from extreme weather. 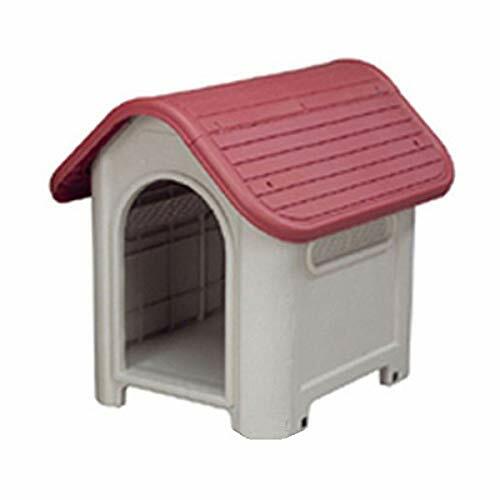 A simple and attractive A-frame outdoor dog house from Tangkula, with a brick red asphalt rain roof. A weatherproof, solid pine outdoor dog house with a draft-resistant tongue and groove design.